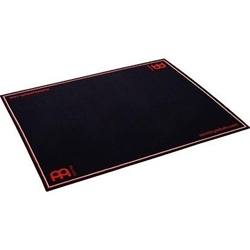 Meinl MDR-BK Acoustic Drum Rug. Avoid the Slip.. The black, white, and red Meinl drum rug measures out to 5 1/4' x 6 1/2'. The entire bottom side is covered with rubber to avoid sliding and it comes with a bag for comfortable transportation. 5.25 Ft. X 6.5 Ft.